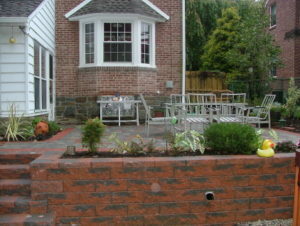 Small to medium sized walls are constructed with the proper batter and engineering for the material used. 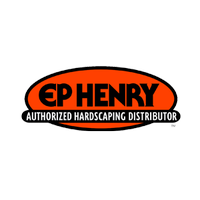 Many of our customers have used E. P. Henry wall stones, but we also can use Imperial, Techo-Bloc, Cambridge, Belgard, Anchor, Hanover, Rinox, CST, Allen Block or any other brand of wall stones. 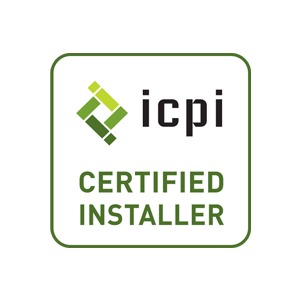 Installation is the same for all of the different brands – see Wall Construction for construction information. 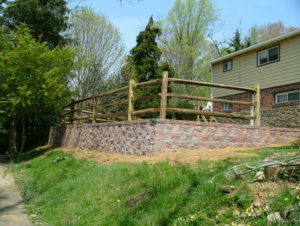 Segmental Retaining Wall Systems can be used for a long-lasting and nicely textured wall. 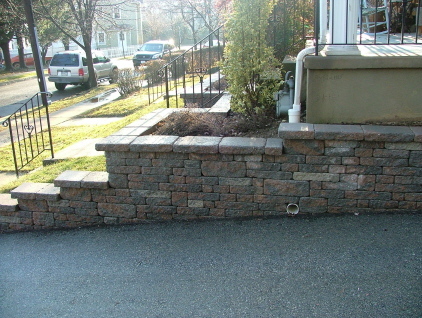 E. P. Henry English Garden Wall, Terrace Wall, Stone Wall Select or Diamond Pro, and Coventry Wall are shown here and come in a large variety of colors. 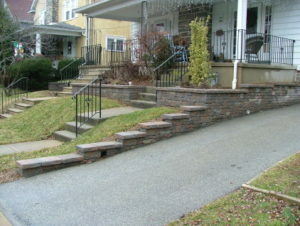 For the last few years new styles and colors of wall stones have been added each year. 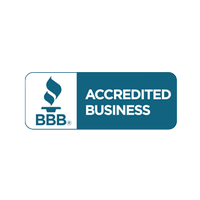 Check out manufacturer’s web sites for more up to date information. To order the current years catalog see E. P. Henry, Techo-Bloc or other paver companies web sites. 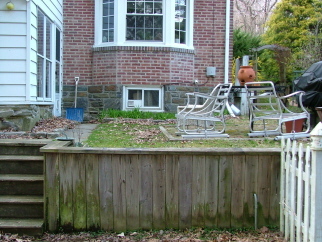 All wall shown were constructed by Robert J Kleinberg Landscape Design & Construction. 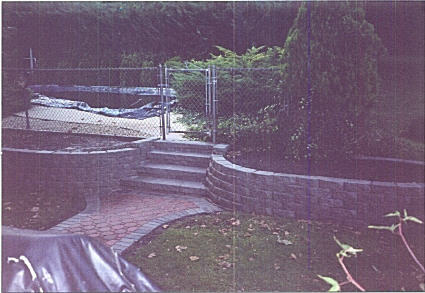 Please view some examples of our interlocking block walls constructed with E P Henry wall stones below. E. P. Henry Terrace Wall comes 6-inches high, 16-inches long and is 12-inches deep. It must be set on a compacted stone base and each layer is connected to the next by a lip on the bottom of each piece that automatically sets each layer back to give each wall the proper batter. 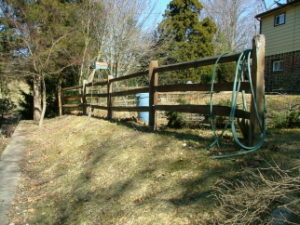 Maximum height of a wall without geogrid is 36-inches. (Above 36-inches geogrid must be used.) Terrace Wall comes in four colors: Autumn Blend (red and gray mix), Pewter Blend, Harvest Blend (brown blend) and Dakota Blend (gray and brown mix), and is designed to go straight or curve with a radius as tight as 2-feet. Walls can be capped with either 3-inch thick Terrace Wall Caps or Bullnose pavers in a variety of different colors. E. P. Henry Stone Wall Select comes 8-inches high, 18-inches long and is 12-inches deep. 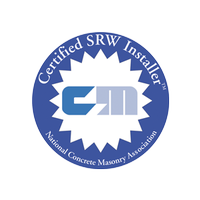 It must be set on a compacted stone base and each layer is connected to the next by clips that automatically give each wall the proper batter. Maximum height of a wall without geogrid is 48-inches. 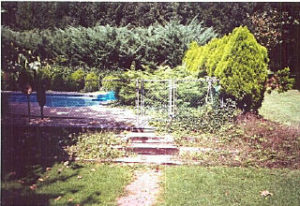 (Above 48-inches geogrid must be used.) 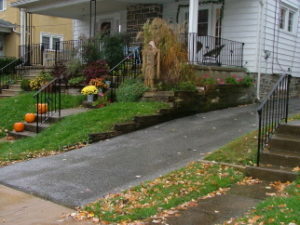 Stone Wall Select comes in four colors: Gray, Autumn Blend (red and gray mix), Tan and Brown, and is designed to go straight or curve with a radius as tight as 4-feet. Walls can be capped with either 4-inch thick Stone Wall Select Caps or Bullnose pavers in a variety of different colors. E. P. Henry Coventry Wall comes in two heights and a variety of lengths, that help give it the look of natural stone. It is 8-inches deep. It must be set on a compacted stone base and each layer is connected to the next by pins that automatically give each wall the proper batter. The pins can also be turned around to make a wall straight up without batter. Maximum height of a wall is 36-inches. (24-inches for non-battered walls.) Coventry Wall comes in four colors: Autumn Blend (red and gray mix), Pewter Blend, Harvest Blend (brown blend) and Dakota Blend (gray and brown mix), and is designed to go straight or curve with a radius as tight as 4-feet. Walls can be capped with either 3-inch thick Coventry Caps or Bullnose pavers in a variety of different colors. E. P. Henry English Garden Wall and Nursery Stone Wall comes 4-inches high, 12-inches long and is 8-inches deep. It must be set on a compacted base and each layer is connected to the next by a lip on the bottom of each piece that automatically sets each layer back to give each wall the proper batter. Maximum height of a wall is 36-inches. English Garden Wall and Nursery Stone Wall comes in six colors: Red, Gray, Tan, Brown, Autumn Blend (red and gray mix), and Harvest Blend (brown blend), and is designed to go straight or curve with a radius as tight as 2-feet.